Sabarimala Verdict: The activists held aloft placards, stating that the court was not bigger than Lord Ayyappa and demanded that the state and central government enact suitable legislation to maintain the age old ban. 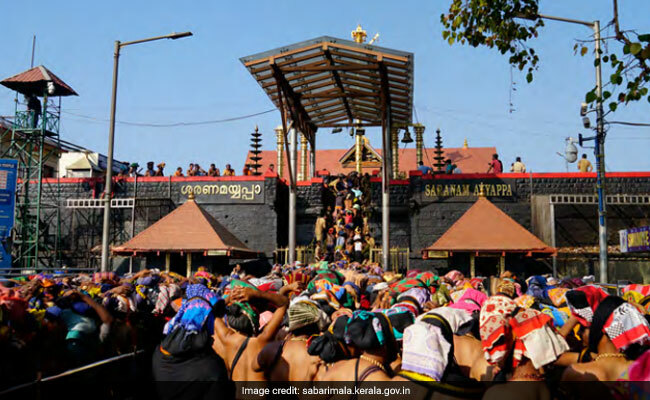 Hundreds of Ayyappa devotees, including women, blocked state and national highways in various parts of Kerala on Tuesday protesting the recent Supreme Court verdict, permitting women of all ages to worship at the hill shrine at Sabarimala. A woman also tried to set herself on fire but her attempt was foiled. The 'Antarrashtriya Hindu Parishad' (International Hindu organisation), an outfit launched by Praveen Togadia after being sidelined from the Vishwa Hindu Parishad, was among the outfits which launched the protests. In the state capital, the activists squatted on the road at Killipalam from 11 AM to 12 AM, chanting Ayyappa mantras, but allowed ambulances and vehicles carrying patients to pass. Ambili, a woman activist from Idukki, doused herself with petrol, but was immediately whisked away by police. The activists held aloft placards, stating that the court was not bigger than Lord Ayyappa and demanded that the state and central government enact suitable legislation to maintain the age old ban. On September 28, a five-judge constitution bench headed by Chief Justice Dipak Misra lifted the ban on entry of women of menstrual age into the shrine. Rahul Easwar, activist and President of Ayyappa Dharma Sena, took out a march from Hanuman Kovil to Palayam here. In Pandalam in Pathnamthitta district, the Ayyappa Dharma Samrakshana Samithi led a march under the leadership of the Pandalam Royal family and observed Tuesday as 'Ayyappa Dharma Samrakshana' (Save Lord Ayyappa) day. A march was taken out from the medical mission junction to the Pandalam Ayyappa temple, in which thousands of people, including women took part, chanting 'Ayyappa Sarnam' and demanded a review of the Supreme Court verdict. The Pandalam Palace Nirvahaka Sangam denied some social media reports that the Pandalam palace would not hand over the "thiruvabharanam" (sacred ornaments worn by Lord Ayyappa) to temple authorities during the Makaravilakku festival, to protest against the court verdict. Roads were blocked at Kollam, Alapuzha, Palakkad and Kochi. The AHP said it would also begin taking signatures from believers visiting temples against the verdict.